WebEngine is a lightweight, versatile, content-centric, open source web framework to quickly build and deliver next generation content-oriented web applications. 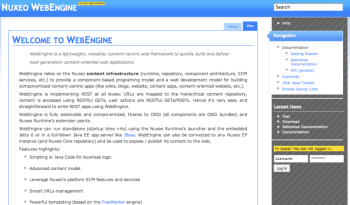 WebEngine relies on the Nuxeo content infrastructure (OSGi runtime, component architecture, document repository, ECM services, etc.) to provide a component-based programing model and a web development model for building componentized content-centric applications (such as wikis, blogs, content-oriented websites, etc.). WebEngine relies heavily on the REST paradigm: URLs are mapped to the hierarchical content repository, content is accessed using GETs, user actions are GETs and POSTs, etc. Hence it’s very easy and straightforward to write RESTful apps using WebEngine. WebEngine is fully extensible and componentized, thanks to OSGi (all components are OSGi bundles) and Nuxeo Runtime’s extension points. WebEngine can run either standalone (with startup time <4s) using the Nuxeo Runtime launcher and the embedded Jetty 6, or in a full-blown Java EE app server such as JBoss. WebEngine can also be connected to any Nuxeo EP instance (and Nuxeo Core repository) and be used to expose / publish its content to the web.